As cold weather approaches so does the dreaded flu season. That’s when you will do anything to keep from getting that drippy nose and stuffed up head. You can try to stay away from other people to avoid getting sick, but sometimes a head cold will find you. That’s when Eucalyptus (Eucalyptus globulus) essential oil becomes your ally. The fresh, herbaceous smell of Eucalyptus is beneficial during cold and flu season. It is an antiviral decongestant that loosens mucus and lowers body temperature. It also prevents bacterial growth and inhibits the growth of viruses, so it is used to disinfect surfaces that an infected person has touched. Wounds and sores also benefit from this oil with its antiseptic and antibacterial properties. 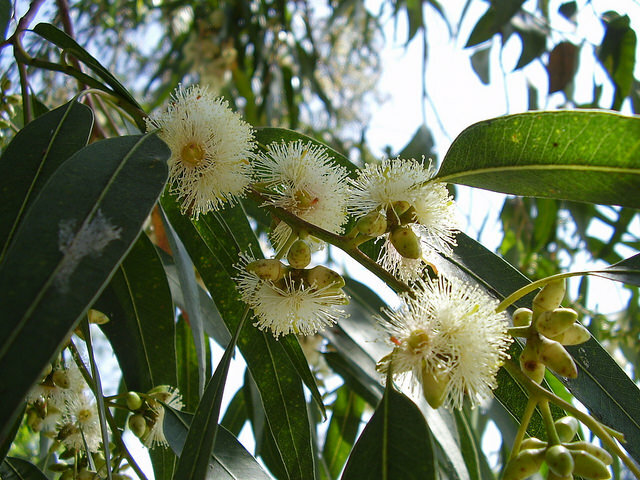 Eucalyptus can kill head lice but also ease the pain of sore muscles, body aches, rheumatism, and rheumatoid arthritis. There are over 300 species and 700 varieties of Eucalyptus, with Eucalyptus globulus being the most commonly used. Other varieties are citriodora (with a lemon scent), dives (with a peppermint note), radiata (with a softer aroma), and smithii (which is gentler and best for children). Each oil has a slightly different chemical composition so the varieties have different applications. Gently combine ingredients in a spray bottle until mixed. To use, spray onto a cloth and wipe the area. Wipe surface with a clean, damp sponge to remove any residue. Note: use a face mask when measuring borax so you don’t inhale the dust.